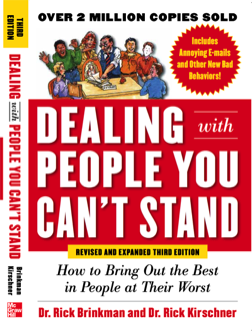 The classic guide to bringing out the best in people at their worst—updated with even more can't-standable people! Dealing With People You Can't Stand has been helping good people deal with bad behavior in a positive professional way for nearly two decades. Whether you're dealing with a coworker trying to take credit for your work, a distant family member who knows no personal bounds, or a loud cell-phone talker on line at the grocery store, Dealing With People You Can't Stand gives you the tools for bringing out the best in people at their worst. Dr. Rick Kirschner and Dr. Rick Brinkman are naturopathic physicians, professional speakers, and trainers. © 2012 R&R Productions, Inc. All rights reserved.